We need a source of Wolbachia for injection into the mosquitoes. Using primers from Simōes et al. (2011) Áki and Maria were able to get these PCR products. The gel is shown sideways with shorter fragments to the left. 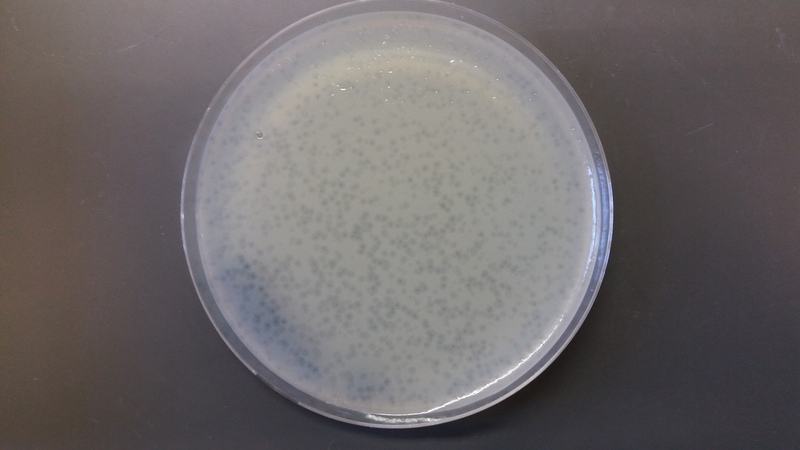 Our white stock of Drosophila melanogaster is positive for Wolbachia infection. The Oregon-R stock appears to be uninfected. The Culex mosquitoes collected locally here on Oʻahu also appear to be infected and give a double band. We submitted them for sequencing and the Culex sequence came back very messy---consistent with possible super infection of multiple strains. However, the Drosophila w sequence was clear enough to get a basepair sequence. Here is the full sequence we recovered. This appears to be a Group A Wolbachia and is consistent with wMel. Simōes, P. M., Mialdea, G., Reiss, D., Sagot, M. F., & Charlat, S. (2011). Wolbachia detection: an assessment of standard PCR protocols. Molecular Ecology Resources, 11(3), 567–572. This entry was posted in Uncategorized on October 11, 2016 by Floyd A. Reed. 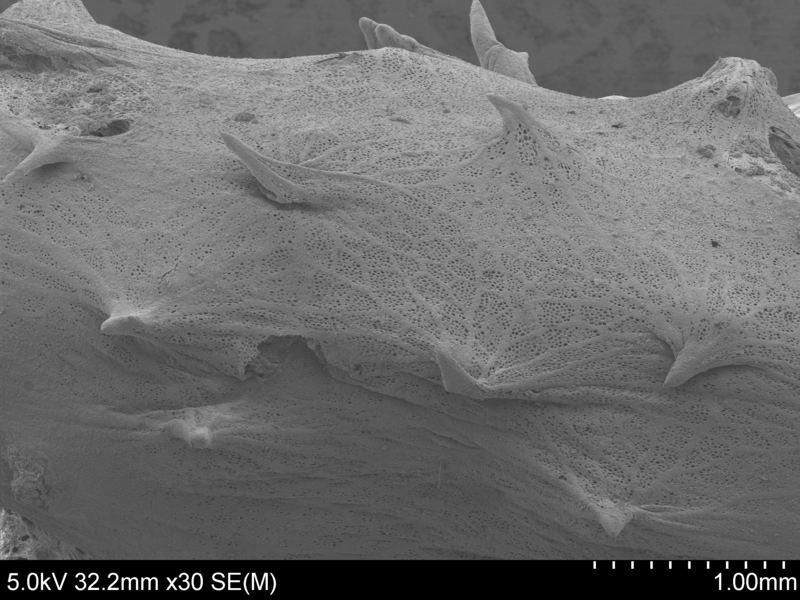 Michael Wallstrom and Áki Láruson made some scanning electron microscope images of a new species of marine sponge we are working on (it is associated with invasive algal mats here in Hawai'i). I can't resist sharing a few of them here but I am saving the best for the publication we are working on. Above is the surface of the sponge. If you look closely you can see the tiny ostia pores in the surface. A closeup on the ostia, one is in cross section to the interior of the sponge. 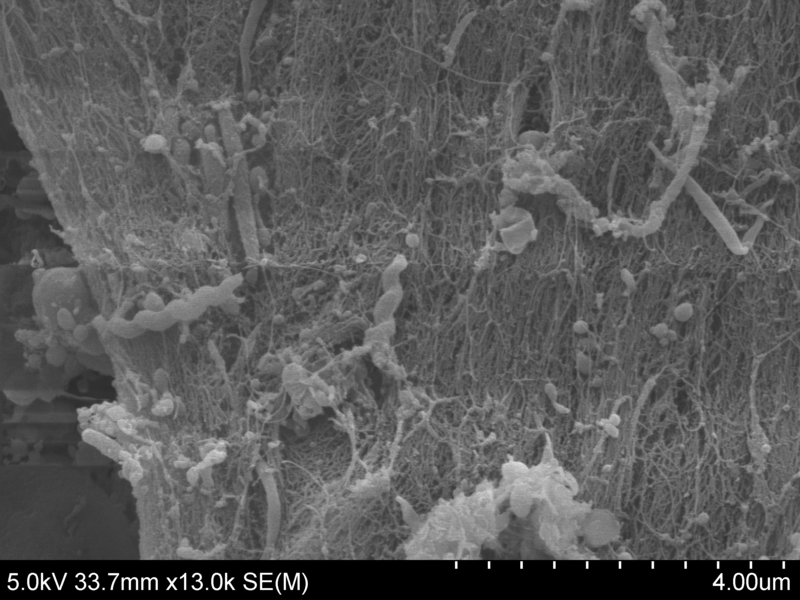 Above, you can see two types of cells inside the sponge. 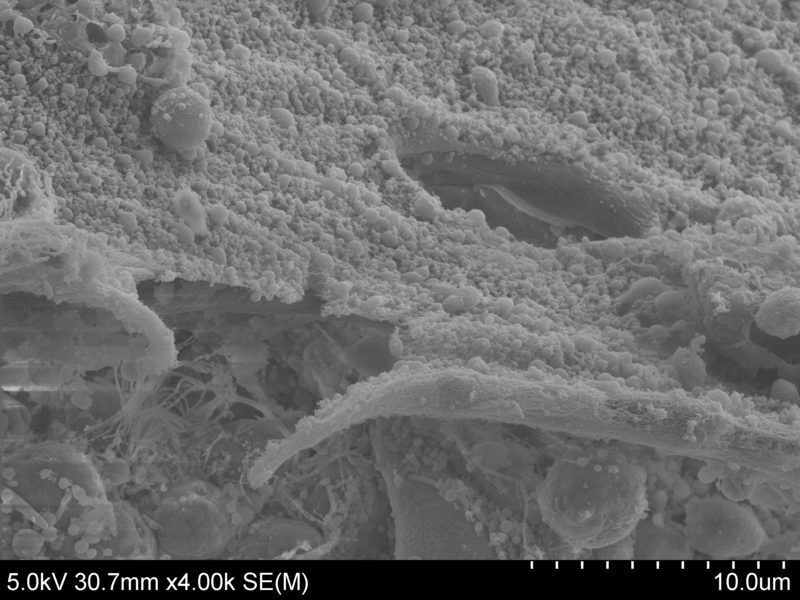 The choanocytes use flagella (the threads) to move water through the sponge and filter food particles out of the seawater; amoebocytes crawl around and transport nutrients to other cells (among other functions). 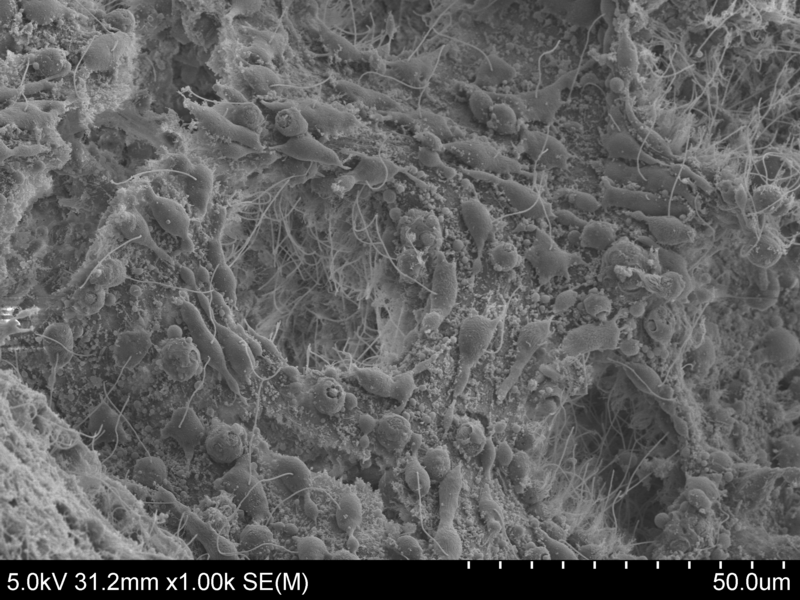 In the above image, at the highest magnification for these images, you can see bacteria that are living in the sponge. The spiral objects are spirochaetes; some of these cause diseases in humans like Lyme disease, syphilis, relapsing fever, and leptospirosis. This entry was posted in Uncategorized on October 8, 2016 by Floyd A. Reed. Another undergrad, Stacy Paulino, is doing a project developing methods to discover phages that infect a marine bacteria that in turn cause disease in coral---as a kind of phage therapy for coral diseases. She recently obtained some nice plaques (clear areas where the virus has killed the bacteria growing on the plates). This entry was posted in Uncategorized on October 7, 2016 by Floyd A. Reed. An undergrad, Angelina Holcomb, is working on a telomere-aging genetics project in the lab. While setting up crosses she noticed an odd eye phenotype. 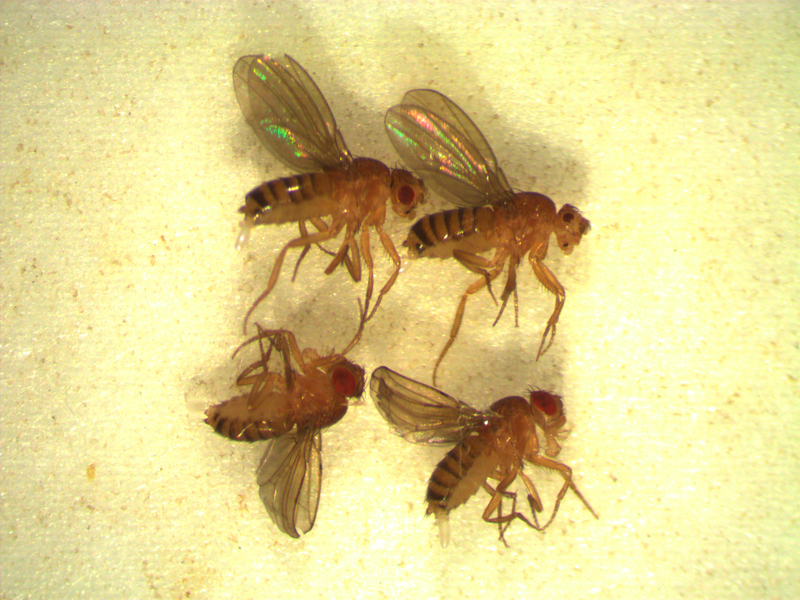 The two flies at the top of the image have smaller eyes and disrupted head development, along with some other more subtle phenotypes, compared to their sibling controls at the bottom of the image. This entry was posted in Uncategorized on October 5, 2016 by Floyd A. Reed. In a graduate "Ecology & Evolution" class I am co-teaching this semester I, on a lark, asked the students to write a Haiku on the Expectation-Maximization (EM) algorithm. I introduced it in class to talk about finding maximum-likelihood answers to some complex problems using a simple approach. Earlier I gave them some homework problems to find answers to by writing EM algorithms in R. We had a midterm exam coming up and there is not enough time in-class for the students to program a new algorithm in R for an exam question. Rather, I asked them to write a Haiku about it to see what they would write and if this gave me any insight into their understanding of the method. I like the results so much I am posting them here. and again and again, yay! This entry was posted in Uncategorized on October 1, 2016 by Floyd A. Reed.